You can apply the Start, Pause or Remove operations over a multiple downloads if you select them using the Shift button. Pause all - this function will pause all running downloads and put them in pausing state. Start all - this function will restart to run all pausing downloads. Transfer Details - Select Show Details in the View menu reveal transfer details of FTP/HTTP connection for every Thread(segment) or chart of the download. Choosing 'Progress' item you will see the dynamic chart of the download, where the gray drops represent the pieces of the file awaiting for download. Green drops point to the actual download size for every segment. 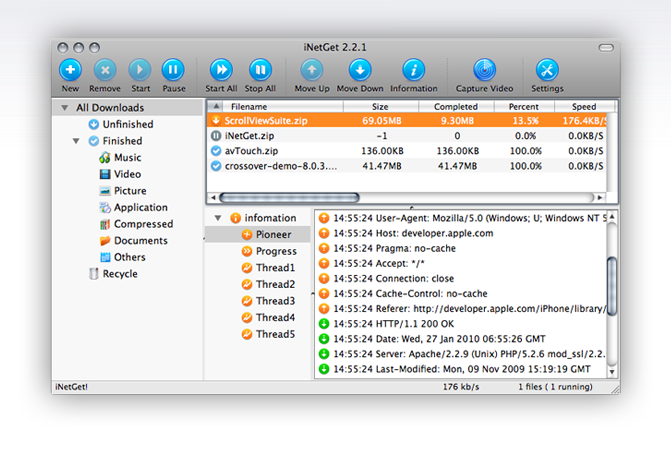 Blue drops represent the already downloaded parts of the file download. If you choose any Thread[1-...] item in the Transfer Details table you will see all header requests to the server and server responses to iNetGet for the chosen segment. This information will be useful to people with advanced knowledge of FTP and HTTP transfer protocols. Open File - helps you open the selected files that you have downloaded automatically. Send to other folder - helps you send the selected files to any other folder as you want. Reveal in Finder - helps you open the folder the file saved and hightlight it. Download again - helps you download the selected files again. Copy URL to ClipBoard - helps you copy the URL link to clipboard. Show/Modify Information - Show file information for you modify. selected, it will monitor URL on ClickBoard and add new download for downloading. can show or hide the blue float window.